This is a winter without skiing in the Alps. The reason: These cold winter weeks are more a self experience group with my mother, 85 years, and her friend Ilona from her youth days during WWII in Paris. Ilona is now 95 years old. Last not least: my woman Mimamai - 47 years young. Two weeks ago I have visited the Old Ladies in Bad Duerrheim, one hour drive north from Lake Constance, 300 Kilometres from Munich. 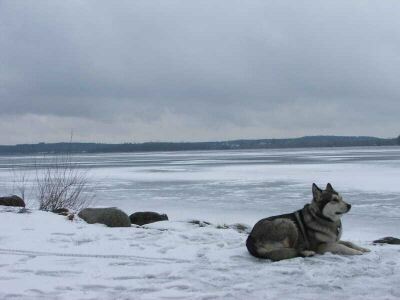 A Russian cold weather fronts holds Europe in an ice frosty grip. Around hundred people freeze to death, roofs crash under tons of snow and kill people, and many drivers on ice streets loose their costly possessions or even life in accidents. First my old mother doesn't want at all the 650 Kilometre long travel to her friend Ilona. Finally we could convince her, that a voyage will strengthen her life energy. My brother Ulrich drove her to Bad Duerrheim three week ago. Now after three weeks she has to drive back, because her clothes have to be washed. 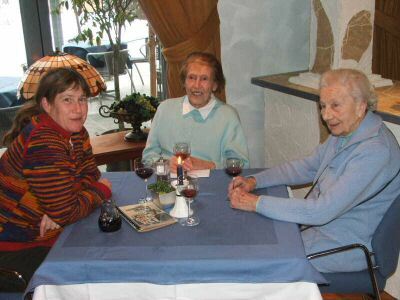 Her 95 years old friend has worked all life after war as nurse in the U.S. From there she gets her retirement money, to live comfortable as long time resident in a clinic of Bad Duerrheim. Lake Constance is many winter weeks under thick, grey fog. Only 60 Kilometres north is much more sun, therefore the name: Bad Duerrheim - something like ''Dry Home''. Old Ilona is nearly blind after an eye operation two years ago. But she wants to fight against the doctor, to gain money for her lost eye light. Both Old Ladies are strong, straight fighting women. They walk on two sticks over snow and ice. My old mother even falls once flat on the ground. A man had to help her on her feet again. Both Old Ladies are strong, straight fighting women. Old Ilona falls in hurry in her room, and complains about my Old Mom, that she does not wait for her. My old Mom complains about her old friend, that she doesn't speak the truth. 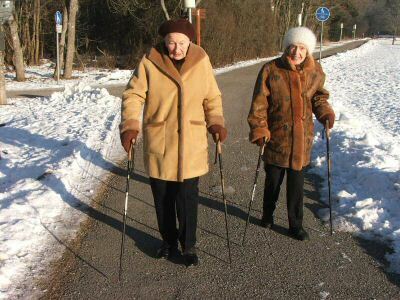 These kinds of quarrels and difficulties are the best medicine, to keep the Old Ladies alive! In Bad Duerrheim Mima and I spend the night in a 40-Euro-Hotel after the rejuvenating sauna bath in the salty thermal waters. 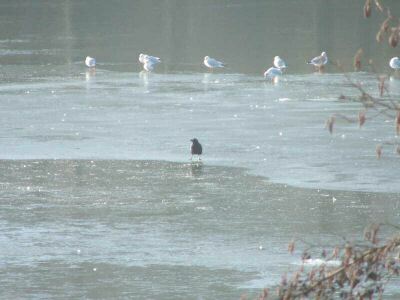 The temperature falls again to 15 degrees Celsius below zero. Unwillingly my Volkswagen starts in the morning still with his first battery. The vehicle is after more than seven years and 200.000 Kilometres still solid. On a sunny Saturday we drive Old Mom 650 Kilometres from Bad Duerrheim to Bad Laer. Mother emotions can turn from hell to heaven and back in less than in five minutes. In some ways she behaves like a little child. But the old ears of Mom can't hear her. And after more than 400 Kilometres drive we are tired. And when Mima wants her food, it's better to get her something! So we choose two delicious plates and a salad. With a bottle of beer Old Mom changes her mood completely. And with sweets and coffee after the meal she praises the place as ''paradise''. The girls behind the counter start to giggle. In the afternoon we arrive in Bad Laer. My Mom is the only guest in the hotel. Meanwhile the owner has installed a telephone in her room with huge numbers to dial. We leave Bad Laer very early in the morning before coffee. Mima doesn't want to drive in the dark. So I wake her up at 6.00 a.m., but in reality it is 5.00 a.m.
For hours I drive in the cold winter morning. Mima wonders, how long these dark winter mornings last. Finally, a quarter past seven a beautiful sun rise brings colours back. 400 Kilometres behind Bad Laer we have lunch with Mima's father, his friend, brother and sister in Bamberg. One hour drive more we meet my lovely little daughter lady and her friend in Nuremberg. Sunday at 6.00 p.m. we have finally finished our big tour around Germany. Nearly 2000 Kilometres again and time for another sauna bath! Is this my reason to write e-mails in groups?